The Ladies love me! Perfect for boys of all ages! The letters are filled stitch, so no tedious cutting of applique fabric. Same look, less fuss! 4x4: 3.91 x 2.75. SC: 8326. 5x7: 4.91 x 6.95. SC: 12,778. 6x10: 5.92 x 8.36. SC: 11,395. 8x8 or Durkee Hoop: 7.28 x 5.15. SC: 19,386. The Ladies love me! Perfect for boys of all ages! 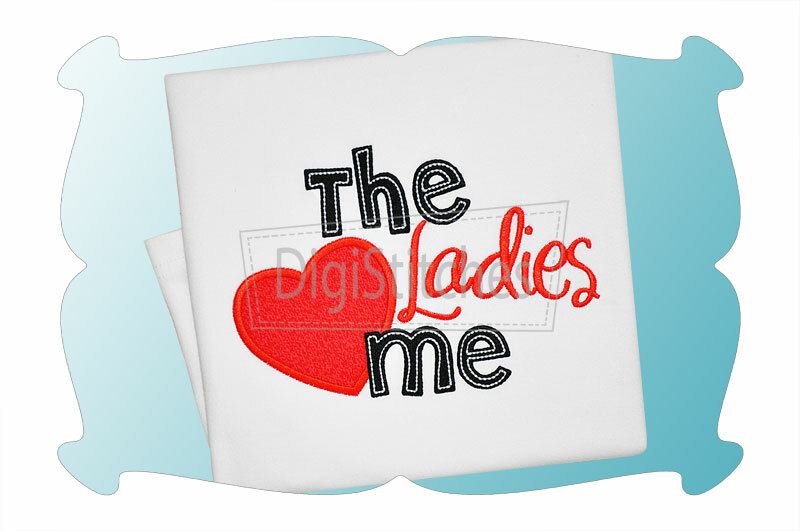 The Ladies Love Me applique comes in 4 sizes. All sizes included with your purchase!